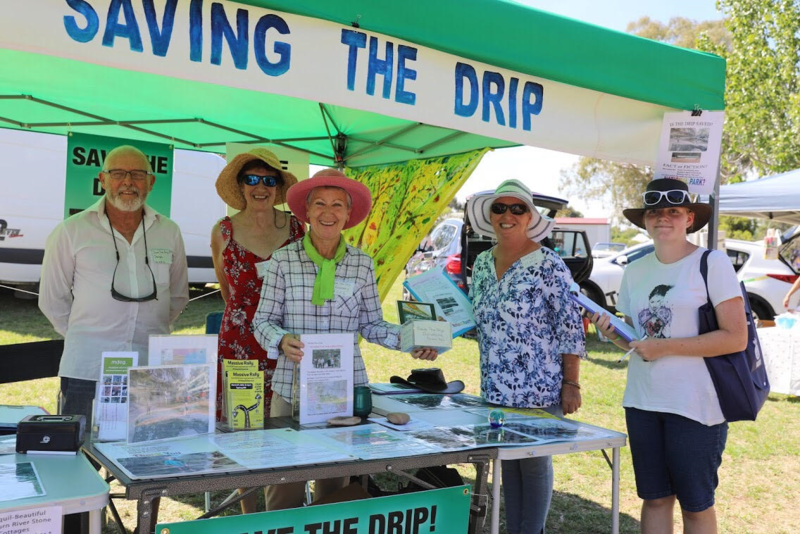 Members of Mudgee District Environment Group (MDEG) are passionate about The Drip. Many locals and visitors to the region share our enthusiasm. This was evident by the number of people interested in our information stall at Mudgee Show. The response to our petition was very encouraging. Locals told stories of childhood walks, picnics and swimming at this iconic location. Encounters with eels and other wildlife were a regular feature of these stories. Often 3 generations were involved in outings there, as an appreciation of the beauty and naturalness of this environment was passed on to children and young people. It was obvious that warm family stories and memories were created at The Drip. It was great to hear the reminiscences! New-comers and visitors to the district had been recommended to visit The Great Dripping Wall. They had heard of its significance, intended to check it out, and wanted to find out more. There was widespread concern about the risk to The Drip. Clipboards were re-loaded with petition forms as signature after signature was added. The petition asks the government to protect the groundwater that actually feeds The Drip. The way to do this is to prevent tunnelling under The Drip from the North side. MDEG is holding a raffle to fund our Save The Drip campaign. You have a chance to stay for 2 nights in a beautiful, tranquil setting near The Drip. Goulburn River Stone Cottages have offered this wonderful experience as first prize. The cottages are unique. See http://stonecottages.com.au/ for more information about this stunning place. Want to take The Drip home, and look at it whenever you like? Second prize includes an original fine art print of the wall, by a local artist. Third prize is a hamper of wonderful Mudgee produce. Our information stall with a team of MDEG members will be at some of the local markets in coming months. Come and see us, get the facts, sign the petition, buy your raffle tickets! We would love to hear your stories.